Let me begin with two brief apologies – first, my last post on Iraq on TOD was hit with a vast quantity of spam that made it difficult to find all the pertinent comments, hopefully this post will have a little easier time. 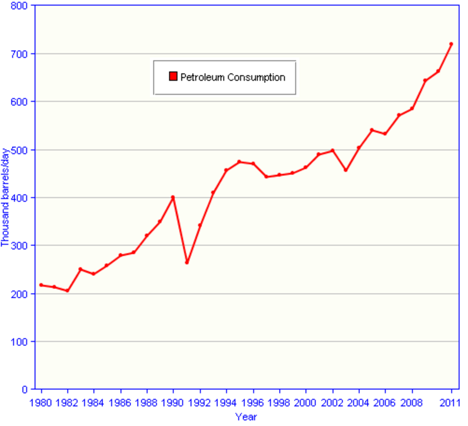 And secondly, although I used an EIA graph to show Iraqi production and consumption, Westexas was kind enough to point to an error in the domestic consumption plot. The more accurate consumption plot can be found here through 2011, and the figures for last year are up to 880 kbd, higher than the plot I showed, and close to the current capacity (900 kbd) of the refineries in the country. 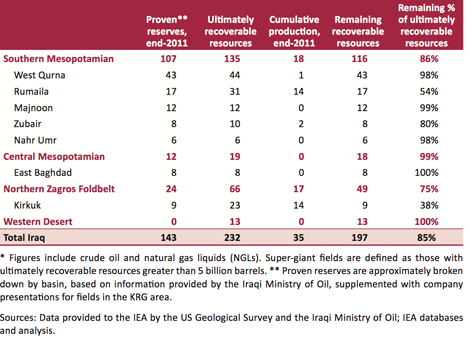 (Some of the difference between the two plots comes about because Iraq continues to import significant quantities of refined oil products . Last week I mentioned that, while the potential production from current contracts in Iraq held great promise for the future, that it was unlikely that those targets would be reached. This post is meant as an explanation for that pessimism, but it should be noted that Iraq, itself, is now seeking to revise the initial targets since it perceives that too much oil in the market may well be destabilizing. This, even though growth is spread over the next decades, and demand is projected to increase at more than 1 mbd/year for the next few years. 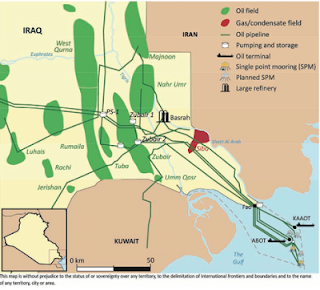 The problems that Iraq faces, beyond those of dealing with internal politics and violence (which continues at a new and higher level than in the recent past), are related, in part to the problem referred to in the first paragraph, namely that the country is starting to have bump up against infrastructure bounds on the volumes that can be moved and processed, relative to that which might technically be brought out of the ground. And even as projects move forward to get the oil out of the ground, there is an underlying issue that remains to be fully addressed. 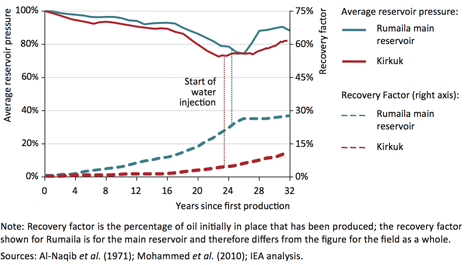 This is the need to inject water, and the basic explanation of that need can be found in an earlier post that was written about the problems that Saudi Aramco had to overcome to reach the levels of production that they have. (Stuart Staniford wrote a long post on the Saudi situation back in May 2007.) 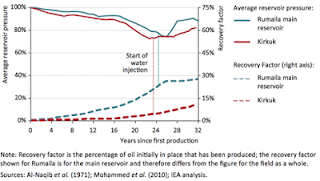 Simplistically as oil comes out of the ground, so the pressure in the reservoir falls, and without means to sustain it, the oil production rate would soon fall off dramatically. In order to sustain pressure water is pumped into the reservoir, even as the oil leaves, with the idea being that the water not only helps to sustain the driving pressure in the formation, but that it also helps displace the oil and move it towards the production wells. 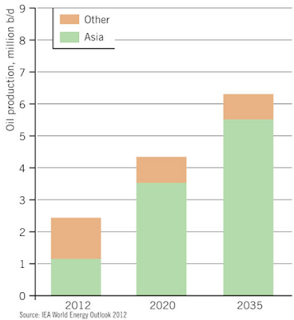 Iraq has the same upcoming problem, if it is to increase production to the levels projected. This is not to question the size of the resource available, rather it is to inject a note of caution into assumptions that this oil will soon appear on the world market. The above table does not reflect the potential from future discoveries and developments in the country. Geophysical surveys have found 530 potential prospects, of which only 113 have been drilled, with oil being found in 73 of the wells. However, over the next twenty years it is likely that the majority of production will come from Rumaila, West Qurna, Zubair and Majnoon. But the scale of this increase in production will require large volumes of water, estimated at 1.5 barrels of water for every barrel of oil produced. Given the growth in production this will require, in time, a flow of up to 12 mbd of water into the fields. This cannot be fresh water, since the country already has some problems supplying domestic needs, but rather must be seawater, supplied from the Persian Gulf. Plans for this, through the Common Seawater Supply Project, have been in the works for a number of years. Yet it was only recently that the management contract for the Project was signed. The original plan was to have the water flowing from the Persian Gulf by the end of this year. At present the goal remains to have 2mbd of the water available by 2017 which should technically be feasible, given the relative simplicity of the technical needs. However the delays that have already been caused by political and bureaucratic problems are likely to persist. As an example the initial announcement concerning the management contract was made last October, but it was not confirmed until this March. Tenders for the design were to be issued in April, but this is already a year late for the 120 km pipeline and distribution network that will be required. 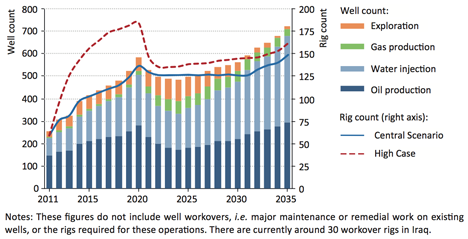 In addition the drilling rigs in the country will increasingly have to also drill water injection wells to match the production wells and even surpass it to provide enough pressure in the ground. The IEA notes, euphemistically, that it will be “a considerable challenge” for Iraq to find sufficient rigs and crews to achieve production levels much above the numbers required for the above scenario in the years surveyed. And there remain the problems relating to infrastructure. Iraq is finding some difficulty in constructing new refineries within the country, and the infrastructure required to move oil, once produced, to ports where it can be shipped to customers is also lagging behind initially projected schedules. The Oil Export terminal is being expanded, with new single point mooring systems being located roughly 120 km offshore, and raising the ultimate loading capacity from 1.8 mbd to 4.5 mbd. Yet the slow pace of contracting, and the other problems that the country faces make it hard to remain optimistic that even the targeted production of 6mbd that the IEA projects for 2020 is likely to be achieved. And if Iraq is unable to meet the production projections on which the balance of supply and demand has been predicated, then the world may be in trouble faster than currently projected.